The matches were held on a knockout basis over a short period and included the club’s main trophy, the Jackson Trophy, named in honour of two late members Dave and Fred Jackson, plus a handicap competition and a doubles tournament. 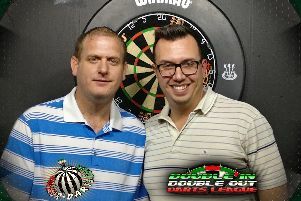 The winner of the Jackson Trophy, and club champion, was Steve May, who managed to overcome Jon Woosley 15/6, 15/12, 15/9. The plate competition was won by Kevin Hughes after a very competitive game against Dave Barrow, Hughes finally triumphing 15/12, 14/16, 12/15, 16/14, 15/10. The handicap tournament was also won by May who beat Woosley, who was carrying an injury towards the end of the game, in a tight match that ended 7/15, 15/8, 15/11. The plate handicap competition was won by Gary Raymond, who beat Dave Lawrence 15/8, 15/6, 15/8. The doubles competition was rather surprisingly won by the veteran pairing of Mike Yung-Hok and Phil Tapping, who overcame the partnership of Woosley and Mario Ponterosso 15/13, 15/12, 15/9. The club is based at the Arun Leisure Centre on Felpham Way and runs a team in the Sussex County Squash League who, as the season’s end approaches, are vying for top spot. They also run internal leagues throughout the year. New members are always welcome - details on the club’s website or from the Arun Leisure Centre.